Maria Sibylla Merian was a German born Swiss naturalist, entomologist, botanical artist & all around BADASS woman born in 1647. One of the first naturalists to observe insects directly (as opposed to dead specimens), she collected live insects & created detailed drawings to illustrate insect metamorphosis. In her time, it was very unusual that someone would be genuinely interested in insects, which had a bad reputation & were considered vile & disgusting. In 1699, the city of Amsterdam granted Merian permission to travel to Suriname in South America (a Dutch colony at the time), along with her younger daughter Dorothea Maria, to study & illustrate new species of insects. Scientific expeditions at this period of time were not common. It was also almost unheard of for a woman to travel any great distance, especially without the accompaniment of a man. Only men received government funding for trips, so Merian financed the entire mission herself by selling 255 of her own paintings. 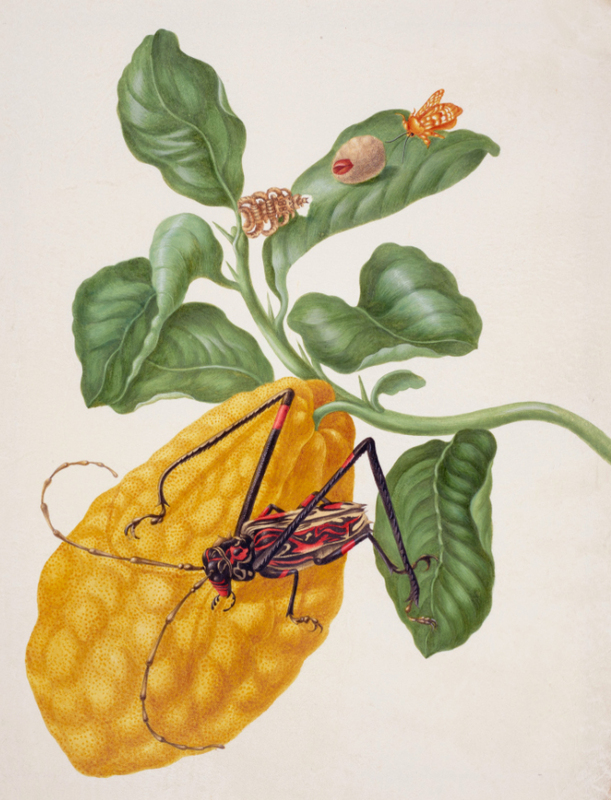 In her lifetime, Merian described the life cycles of 186 insect species, amassing evidence that contradicted the contemporary notion that insects were "born of mud" by spontaneous generation. She not only described the insects she found, but also noted their habitat & habits, as well as many other details of the evolution & life cycles of the insects she observed. For example, she showed that each stage of the change from caterpillar to butterfly depended on a small number of plants for its nourishment. She noted that as a consequence, the eggs were laid near these plants. Almost two centuries before the German zoologist Ernst Haeckel coined the term Oecologie—ecology—Merian published plates that depicted ecological communities. Information compiled from HERE, HERE, HERE & HERE.